WSN, clustering, heterogeneous wireless sensor networks, hierarchical routing, DEEC, BEENISH. Nowadays, the wireless sensor network is working on communications, sensors, energy storage, and low power computing. Clustering techniques made for the WSN to operate more efficiency. It increases the power consumption of the sensor network and therefore prolonging lifetime. LEACH by Heinzelman et al. is a protocol based on the first clustering technique in which Cluster Heads (CHs) are chosen at randomize. The main role of CH ,  is to provide data communication between sensor nodes and efficient base stations. Therefore, the cluster head should have higher power than the other nodes, so that it performs data gathering. 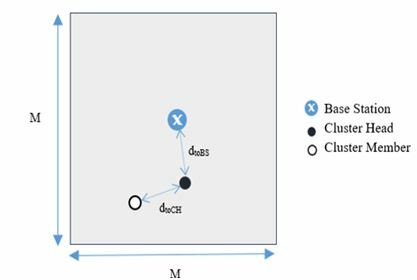 Other recommended improvements for LEACH are DEEC , DDEEC , TDEEC , EDEEC , EDDEEC , BEENISH  are clustering-based algorithms in which clusters are selected based on the probability of the remaining energy ratios and the average power of the network. When they go from the first directions to the most recent clustering algorithms in heterogeneous WSN, It includes its main features in the selection of CH, cluster formation, as well as some limited issues where algorithms only consider CH options based on energy levels that have not yet been considered to the average distance between the nodes to the base station and their CHs which their purpose is to balance the energy between the near nodes and far nodes from the average distance of a node to their CH as well as the BS. This motivates us to introduce a new clustering-based routing algorithm in the heterogeneous WSN network. In this paper, our protocol proposed an improvement based on the two protocols: BEENISH and DEEC. The main idea is that still based on the ratio between the remaining energy and the average energy of the entire network in the current round for each heterogeneous node type to construct the probability for choosing a node becomes to CH as above protocols. However, the proposed protocol will add the distance estimation component to the CH selection probability as well as add the remaining energy estimation component to determining the constraint for a node during the clustering process. This proposed protocol consists of four levels of heterogeneity with four different node types (normal, advance, super, and ultra-super nodes) with different power levels, the process of selecting clusters from nodes have higher power and shorter distance to the base station. The proposed protocol prolongs the network life-time, the throughput, especially the stability period, by homogeneous awared clustering algorithm. Simulation results show that proposed protocol achieves longer network lifetime, throughput and stability period than BEENISH in four-level heterogeneous environments. The paper is organized as follows: Part 1: Introduction, Part 2 covers related research issues; Part 3 is the proposal protocol, followed by part 4: Simulation of the proposed algorithm;The last part is the conclusions.. 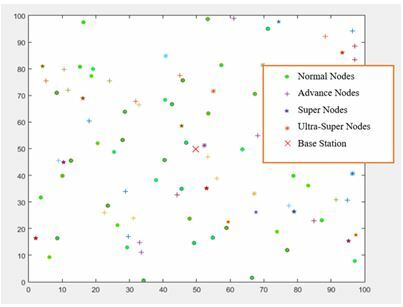 There are a lot of Clustering Algorithm in WSN. In this part, we will only consider to main DEEC, DDEEC,TDEEC, EDDEEC and BEENISH algorithms that it related directly to our proposal Qing and et al. proposed a DEEC protocol based on the idea of Leach. The feature of this protocol is to select the CHs using a probability-based approach to estimate the remaining energy ratios of each node and the average power of the entire network. DtoCH: Average distance between the member node and its CH. Accordingly, the nodes with high residual energy will become CH more often than low power nodes. The simulation results show that DEEC has a longer lifespan than the LEACH protocol in a heterogeneous environment. The limitation of this protocol is that the average energy is estimated to be inversely proportional to the energy consumed in each loop. This is a constraint in estimating DEEC’s model. Protocol (DDEEC)  is very similar to DEEC. The difference between the two lies in the expression defining the probability for the normal and advance nodes to become a CH. After several rounds of data transfer, the advance nodes have the same energy remaining as the normal nodes. In this stage, DEEC continues to punish the advance nodes because the probabilities selected for the advance nodes are higher than the normal nodes, which is not the optimal method, so the advance nodes die faster than the normal nodes. To avoid this imbalance, DDEEC introduces the remaining energy threshold. When the energy levels of the advance and normal nodes fall below this threshold, the same probability is used for all nodes to become CH, making the CH selection process more efficient. TDEEC uses the same CH selection process and estimates average energy as in DEEC. At the start of each round, the decision nodes become CH by choosing a random number between 0 and 1. If the selected number is lower than the threshold T (s), the node becomes CH for that round. The simulation results show that the EDEEC and TDEEC protocols are better than the DEEC. Parul Saini and Ajay K. Sharma has proposed protocol EDEEC  uses the concept of three levels of heterogeneity in WSN. It consists of three types of nodes – normal, advance and super based on initial energy. 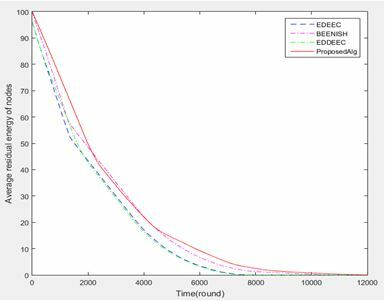 EDEEC combines different probability values for normal, advance and super nodes. In 2013, N. Javaid et al. suggest improvements EDDEEC protocol  based on DDEEC and EDEEC protocol. The difference between EDDEEC and DDEEC is that it uses three levels of heterogeneity in the WSN through the three node types that were introduced in EDEEC. On the other hand the parameter c in the general formula for calculating probabilities for all nodes when nodes and advance super energy level falls to the threshold Tabsolute là c≈0.025 not like c≈0.02 in DDEEC. Also in 2013 N. Javaid et al. went on to make a new protocol BEENISH  is based on the protocol EDEEC. The only difference is that it consists of four types of nodes – normal, advance, super and ultra-super based on initial energy. BEENISH conbine to different probability values for normal, advance, super and ultra-super nodes to increase heterogeneity in the WSN. The results show that this protocol significantly improves stability, energy efficiency and extends network life. Based on the clustering algorithms inheterogeneity WSN, we have built a routing algorithm based on the protocols  is based on the ratio between the remaining energy and the average energy of the entire network in the current round for each heterogeneous node type to construct the probability for choosing a node becomes CH. However, the improved protocol will add the estimation distance component to the CH selection probability as well as add the remaining energy estimation component to determining the constraint for a node during the clustering process. The main goal of this protocol is to reduce overall network power consumption and prolonging network life. First of all, considering the heterogeneity level in the network, the proposed protocol will remain at level 4, consisting of four types of normal, advance, super, ultra-super nodes with four different initial energy levels, knowledge of the authors  have shown, but instead the proposed protocol will improve the level of forming clusters as well as additional components to estimate the distance in the process of calculating the probability of choosing CH. Similar to the above protocol, each node will select a random number in the range (0,1). If this number is lower than the threshold value of the node si, then it becomes a node CH. Where Ei is the remaining energy of the node si in the current round and the energy Eo is the initial normal node. Pi is defined separately for each node depending on the extent inconsistent, here is 4. 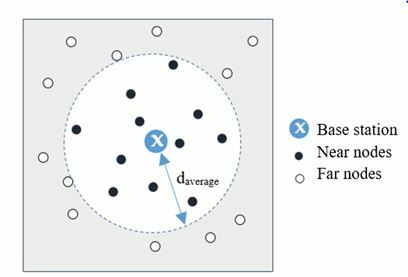 The probability for selecting CH is modified in the proposed protocol by introducing the distance estimation component compared to . Based on daverage, We assigned the distance of near nodes and remote node from the base station as shown in Figure 3.2. Step 1: Calculate the current energy of node i (E i), the energy of the current round (E r) by formula (2.5)and the average distance of any node to the BS (d middle average) according to formula (3.3). Step 3:Consider if dcurrent <= d average then selectionprobability CH P (i) will be calculated using the formula (3.4) (if ) or (3.5) (if). Conversely, if the dcurrent > daverage then the probability P (i) will be calculated using the formula (3.6) (if ) or (3.7) (if). Step 4: Consider the selected node CH which has been CH or not. If not, then select this node as the CH for the next round and move on to step 5, otherwise if the selected node has made the CH within the previous round, then the node becomes the member for the cluster and end theCH selection process. Step 5: Choose a random number from 0 to 1. Then compare this number with the threshold value (based on improved formula (3.1)). If the random number is then the node i becomes the membership node for the cluster and end the CH selection process. Figure 3. 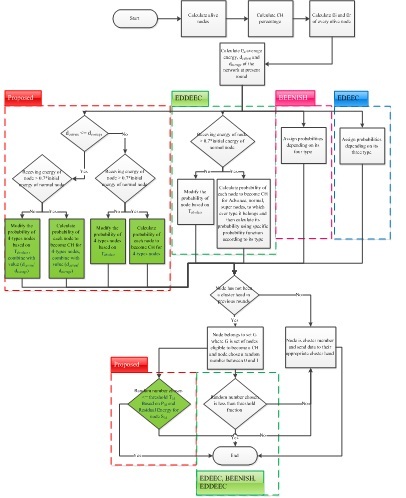 Block diagrams for the EDEEC, EDDEEC, BEENISH protocols, Proposed protocols for the CH selection process. To demonstrate this proposal, we performed protocol simulation using Matlab Language with parametersthat shown in Part 4. The network model used includes N(100) nodes in the MXM network field (100m x 100m). For four sensor types, including Normal, Advance, Super, Ultra-super, are deployed randomly to demonstrate heterogeneity in the sensor network with the BS located at the center of the coordinate sensor field (50, 50) As shown in Figure 4. Sensor nodes are uniformly randomly deployed in the network. There is one base station which is located at the center of the sensor field. The nodes always have data to send to the base station. The nodes do not recognize the position, ie not equipped with GPS antenna. All nodes have similar capabilities in terms of processing and communications. This promotes the need to prolong the life of every sensor. Sensor nodes have energy heterogeneity, which means different energy levels. All nodes have different initial energies; Some nodes are equipped with more power than normal nodes. Performance indicators used for evaluating protocols are:stability time, network life, and number of packets sent to the BS. Stability Time: stability over time, we want to talk to round that thedead first node or round from theinitialize network until the first node dies. NetworkLifetime: The network longevity, mean number of roundwhich all dead nodes or initialize the round from the network until all the nodes are deaded. The number of packets are sent to BS: According to this metric, we refer to the total package is sent directly to the BS from the CHS channel or not CH nodes. In this case, we consider a network containing 50 normal nodes having E0 energy, 30 advanced nodes having 2 times more energy than normal nodes, 14 super nodes having 5 times more energy than the normal nodes and 6 ultra-super nodes having 7 times more energy than the normal nodes. Figure 5 and 6 show the number of alive and dead nodes during the network lifetime. The first node for EDEEC, EDDEEC, BEENISH, and Proposed Protocol dies at 1003, 1409, 1087, and 1817 rounds, proposed protocol is higher 81% EDEEC, 28% EDDEEC, 67% BEENISH of the number of rounds that the first node dies. 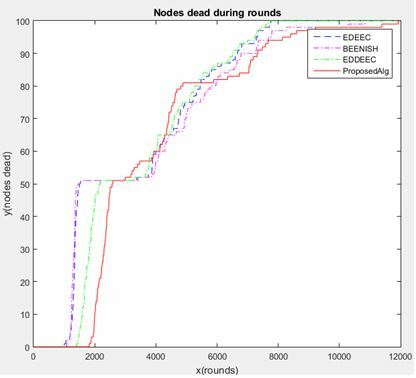 And all nodes die at 7761, 7697, 10839, and 11923 round, proposed protocol is higher 53% EDEEC, 54% EDDEEC, 10% BEENISH of the number of rounds that the last node dies. Figure 7 shows that the data sent to the BS is more for proposed protocol as compared to the others protocols. The throughput for EDEEC, EDDEEC, BEENISH, and Proposed Protocol are 277879, 317084, 300801, and 330375. proposed protocol is higher 18.9% EDEEC, 4.1% EDDEEC, 9.8% BEENISH of the number of packets. Figure 8 shows the average remaining energy of simulation protocols. The result shows that proposed protocol is the most efficient among the other protocols in terms of stability period, network lifetime, and number of packets sent to the BS. The proposed protocol uses the correct heterogeneity of nodes to improve the life of the network. In this paper, we propose a algorithm to increasing the heterogeneity of nodes as in some previous related works, but adds the distance estimation component between the remote nodes and more close BS on to theCH selection probability, as well as additional estimated components remaining energy in the CHthreshold selection. Accordingly, we can see that this proposed algorithm has improved communication between heterogeneous nodes and prolonged the life of nodes to maximize communication. 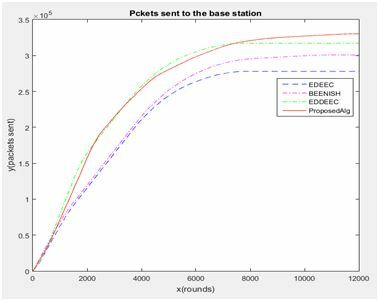 Simulations suggest that the proposed protocol better than EDEEC, EDDEEC and BEENISH, offers a better mechanism for routing as well as balancing energy in wireless sensor networks. W. B. Heinzelman, A. Chandrakasan, and H. Balakrishnan (2002), “An application-speciﬁc protocol architecture for wireless microsensor networks,” IEEE Transactions on Wireless Communications, vol. 1, pp. 660 – 670, Oct. 2002. 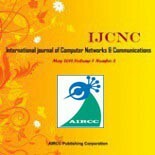 Li Qing, Qinqxin Zhu, and Ming en Wang (2006), “Design of a distributed energy-efficient clustering algorithm for heterogeneous wireless sensor networks”, Computer Communications Journal Elsevier, vol. 29, issue 12, pp 2230-2237, 2006. Elbhiri, B., Saadane, R. , El Fkihi, S. , Aboutajdine, D.(2010) “Developed Distributed Energy-Efficient Clustering (DDEEC) for heterogeneous wireless sensor networks”, in: 5th International Symposium on I/V Communications and Mobile Network (ISVC), 2010. Parul Saini, Ajay.K.Sharma (2010), “Energy Efficient Schemefor Clustering Protocol Prolonging the Lifetime of Heterogeneous Wireless Sensor Networks” International Journal of Computer Applications (09758887), Volume 6 No.2, September 2010. Parul Saini, Ajay.K.Sharma (2010), “E-DEEC- Enhanced Distributed Energy Efficient Clustering Scheme for heterogeneous WSN”, in: 2010 1st International Conference on Parallel, Distributed and Grid Computing (PDGC – 2010). N. Javaid, T. N. Qureshi, A.H. Khan, A. Iqbal, E. Akhtar and M. Ishfaq (2013), “EDDEEC: Enhanced Developed Distributed Energy-Efficient Clustering for Heterogeneous Wireless Sensor Networks”, ELSEVIER, Procedia Computer Science 00, 2013, pp 1-6. 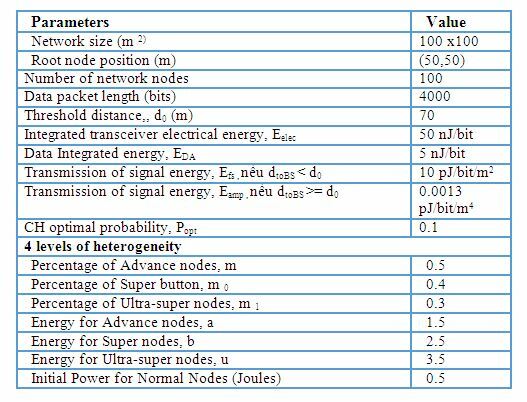 N. Javaid, T. N. Qureshi, A.H. Khan, A. Iqbal, E. Akhtar and M. Ishfaq (2013), “BEENISH: Balanced Energy Efficient Network Integrated Super Heterogeneous Protocol for Wireless Sensor Networks”, ELSEVIER, Procedia Computer Science 19, 2013, pp 920-925. A.Preethi1, E.Pravin, D.Sangeetha (2016), “Modified Balanced Energy Efficient Network Integrated Super Heterogeneous Protocol”, 2016 fifth international conference on recent trends in information Technology. M. J. Handy, M. Haase, and D. Timmermann (2002), “Low Energy Adaptive Clustering Hierarchy with Deterministic Cluster-Head Selection”. Phan Thi The was born in Vietnam in 1982.She received Master Data Transmission and NetWork in HOCHIMINH PTIT, Vietnam, 2012. She is currently a PhD.Candidate in Information System from Post & Telecommunications Institute of Technology, Vietnam in 2019.She is working as a lecture in Thu Duc College. Bui Hoang Mai was born in Vietnam in 1989. He received the B.E in Management information system from University of Economics Ho Chi Minh City, Vietnam, 2015. He is currently a MSc. Candidate in Information System from Post & Telecommunications Institute of Technology, Vietnam in 2017. Tran Cong Hung was born in Vietnam in 1961. He received the B.E in electronic and Telecommunication engineering with first class honors from HOCHIMINH University of technology in Vietnam, 1987. He received the B.E in informatics and computer engineering from HOCHIMINH University of technology in Vietnam, 1995. He received the master of engineering degree in telecommunications engineering course from postgraduate department Hanoi University of technology in Vietnam, 1998. He received Ph.D at Hanoi University of technology in Vietnam, 2004. His main research areas are B – ISDN performance parameters and measuring methods, QoS in high speed networks, MPLS. He is, currently, Associate Professor PhD. of Faculty of Information Technology II, Posts and Telecoms Institute of Technology in HOCHIMINH, Vietnam. Nguyen Thanh Tuan was born in Vietnam in 1989. He received the Master of Management information system from Post & Telecommunications Institute of Technology, Vietnam, 2016. He is, currently, a PhD.Candidate in Information System from Post & Telecommunications Institute of Technology, Vietnam in 2020. He is working as a Teacher at Nha Trang Tourism College, Khanh Hoa, Vietnam.